There is nothing especially new about this salad, except that it is the first of the season, and it seems so early to me. I have recently begun shopping at Edgewater Produce, a small produce market and deli in Andersonville down the street from my office. It is a ten-minute walk from there, so a few times a week I will take a lunchtime walk to pick up fruit and the occasional vegetable. I don't know yet from where their produce comes, but so far it has always been fresh and relatively inexpensive so I stick as much as I can to buying from the clean 15 list and avoiding the dirty dozen. Every few months I notice that my diet has started to lean towards carbohydrates more than I would like it to. It happens when I don't have a lot of fresh vegetables on hand, or when I have been out of town as I was earlier this month. Since this is my year of vegetables, I was determined to do something about it when I noticed it happening last week, so I loaded up on vegetables on my Sunday trip to the store. I also wanted to have more of the carbohydrates I am eating come from legumes than from wheat, so cooked up a batch of black beans with my newly-discovered no-soak cooking method. I had the beans and I had the red onion. I wasn't sure what else I would put together with them, so I thought I would see if there was anything crunchy that looked good at the market on my Monday walk. They had fresh corn at a good price so I grabbed three ears of that, a serrano pepper, limes and cilantro. 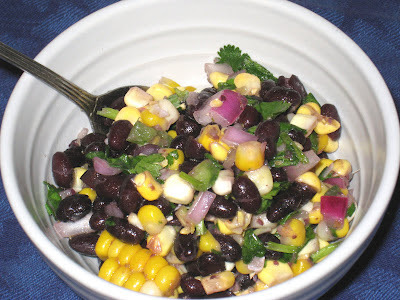 The perfect ingredients for a black bean and corn salad. I wanted to keep it clean and light, so I dressed it with lime juice, olive oil, dried oregano, and salt to taste. Quick, simple and delicious. Combine the beans, corn, onion and serrano pepper in a large bowl and mix together. Add the lime juice and olive oil and mix well. Add the oregano and cilantro and mix once more. Season to taste with salt. If possible, let the salad stand for a few hours before serving so the flavors can combine. Serve at room temperature for the best flavor.